April 13th is Citizen Science Day!! Meet some of the team behind the Polar Collective as we share why we celebrate citizen science, on this day and every day! We’re honoured to have our citizen science efforts included in the latest issue of the Antarctic Times by the United Kingdom Antarctic Heritage Trust. The UKAHT exists “to preserve, enhance and promote British Antarctic heritage to engage, inform and inspire a global audience,” with conservation at the heart of everything they do. The Polar Collective is excited to announce the award of a substantial grant from Booking Cares, a sustainability initiative of Booking.com, to develop a citizen science mobile app. This app will build upon a simple philosophy to make participation in science easy and rewarding. This will be achieved through well applied technology and by delivering feedback to participants that keeps them engaged long after the experience. With the €170,000 grant, the Polar Collective will now begin work on developing the app, aiming to release a beta version for the 2019 Arctic season, with a v1.0 launch for the 2019-2020 Antarctic season. The Polar Collective, in collaboration with the International Association of Antarctica Tour Operators (IAATO) and the Association of Arctic Expedition Cruise Operators (AECO), facilitates citizen science programs on board expedition vessels operating in the polar regions. A growing number of tour operators participate in Polar Collective projects, phytoplankton sampling for the Scripps Institution of Oceanography’s FjordPhyto program, cloud observations through NASA’s GLOBE Observer app, Happywhale’s marine mammal identification database and seabird surveys for the Antarctic Site Inventory, managed by Stony Brook University. The Booking Cares Fund, a charitable initiative of Booking.com, “champions non-profit sustainable travel projects which present new and unexpected solutions to reimagine the industry.” In addition to the grant awarded to the Polar Collective, Booking Cares is supporting 6 other projects that “strengthen local communities, preserve and promote local culture, help disperse tourism and protect natural resources”. Our Polar Collective team is migrating south for the summer! Ted Cheeseman is already at sea southbound through the Southern Ocean towards Snow Hill to visit an Emperor penguin colony. Soon, Alex Cowan and Lauren Farmer will depart Montevideo on their way to the Falkland Islands and then onwards to South Georgia. Bob Gilmore and Annette Bombosch will soon follow. The team is thrilled to be managing ambitious citizen science programs on board 5 expedition vessels this season, with many additional operators beginning or returning to their own data collection projects. With the recent inclusion of our citizen science program in IAATO’s Field Operations Manual, there are more operators and vessels than ever contributing to polar research. We look forward to reporting back from the field and sharing photos of our passionate guests participating in science! The Year of Polar Prediction is taking place from mid-2017 to mid-2019 in order to cover an entire year in both the Arctic and Antarctic and involves the World Meteorological Organization (WMO), Germany's Alfred Wegener Institute (AWI) and a wide array of partners around the globe. Alex Cowan and Lauren Farmer’s sea ice data collection project this austral season at the North Pole has been featured in the latest "Polar Predict" newsletter. The Arctic is historically extremely under-sampled and so polar tourism platforms are making an important contribution to the Year of Polar Prediction! Click here to read the feature (pg 12-14). We are excited to have received the support of the Hurtigruten Foundation. Hurtigruten established the Hurtigruten Foundation to ensure that their guests of tomorrow can enjoy the same meaningful travel experiences as their guests do today; their generous donation will significantly increase and improve the impact of our work to the benefit of science and conservation, in particular on Antarctic whale ID and Antarctic phytoplankton, the two extremes of the vital Antarctic food web. Thank you! Congratulations and thank you to Annette Bombosch and Allison Lee for representing the Collective at POLAR2018 in Davos, Switzerland! This has been a joint event from the Scientific Committee on Antarctic Research SCAR and International Arctic Science Committee IASC, providing an excellent opportunity for journalists to gather information about the latest research from the Arctic, Antarctic and high altitude regions and to meet scientists from all over the world. From Annette - "We enjoyed a great session with fantastic talks from the tourism industry as well as scientists. We are just beginning to unfold the potential of citizen science in polar regions." 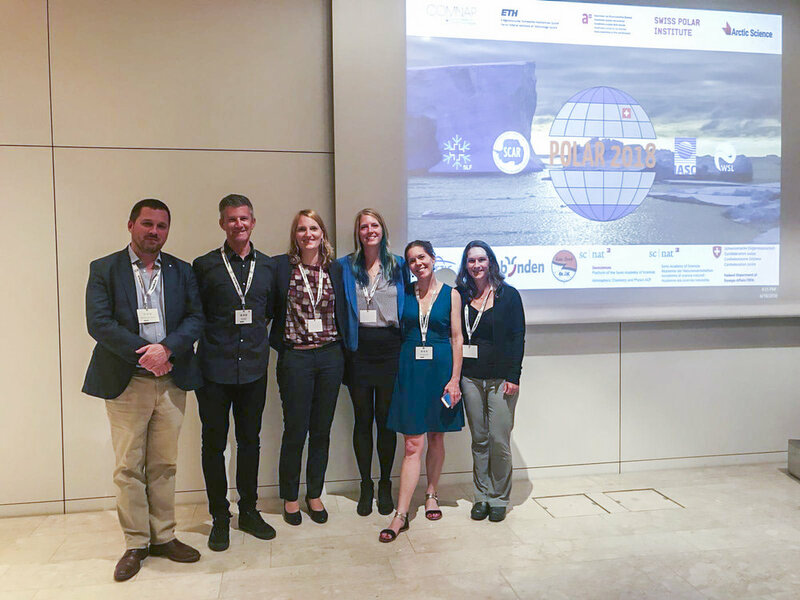 At the 27th annual meeting of the International Association of Antarctica Tour Operators in Newport earlier this month, Polar Collective Chair Dr. Annette Bombosch presented on the updates of citizen science efforts amongst the tourism industry. Citizen science has developed into a recognised tool for data collection benefiting the scientific community as well as an indespensible means in guest education. Participating in citizen science efforts allows guests to gain a deeper understanding of the Antarctic environment, a pivotal step in creating Ambassadors for the protection of Antarctica. The Polar Citizen Science Collective was officially introduced and invited tour operators in participating in the citizen science movement. We want to extend a big thank you to IAATO, Polar Latitudes, G Adventures and all the participating operators for their support of our efforts to spread citizen science projects amongst the operator fleet. We want to extend a big thank you to IAATO, Polar Latitudes, G Adventures and all the participating operators for their support of our efforts to spread citizen science projects amongst the operator fleet. Annette Bombosch presents on the citizen science efforts of the polar tourism industry at IAATO's 27th Annual Meeting in Newport, RI. My name is Allison Lee and I am a student in the Biological Oceanography PhD program at Scripps Institution of Oceanography. FjordPhyto’s first Antarctic season with IAATO members and passengers was a huge success! During the 2017 – 2018 austral summer, we partnered with six companies to directly engage more than 450 passengers in sampling phytoplankton from various fjords along the western Antarctica Peninsula. During the months of November to March, over 72 samples were collected to describe the seasonal wax and wane of phytoplankton growth in the austral summer. The Antarctic Peninsula is a vast region of the world and partnership with IAATO vessels allows for more scientific information to be gathered over a longer amount of time than possible with one research vessel alone. The peninsula is also one of the fastest warming regions in the world. When the temperatures rise, glaciers melt sending freshwater into the sea. Fjords are transition zones between the land and sea environments and these ecosystems are receiving more meltwater, experiencing rapid change. Visitors have the opportunity to measure these changes and collect samples in order to help scientists understand seasonal and interannual dynamics in these coastal fjords. The National Science Foundation (NSF) Public Participation in STEM Research (PPSR) grant provided the first year of funding to launch FjordPhyto. These funds allowed for the purchase of needed equipment, instrumentation, and material to create sampling kits that were distributed amongst the various ships. As an additional bonus, graduate student Allison Lee was invited by ANTARCTICA XXI to be a Guest Scientist on board the Hebridean Sky during a 29-day charter from December 8, 2017 to January 6, 2018. This experience provided invaluable perspective to improving FjordPhyto for future seasons, as well as providing the opportunity for Allison to collect additional samples for her doctoral research and interact directly with passengers. Samples from all IAATO ships will be analyzed for biodiversity using microscopic and genetic tools by graduate students Allison Lee in the Vernet Lab at Scripps Institution of Oceanography, USA and Martina Mascioni at Universidad de la Plata, Argentina. Antarctica is a continent set aside for peace and science, hosting around 4,000 researches during the austral summer and nearly 44,000 visitors to the western Antarctic Peninsula. FjordPhyto can only happen with the support of IAATO and knowledgeable polar guides. It has been an absolute joy to work with the IAATO community, and to see the Antarctic travelers involved in the legacy of polar research. Though our website, data is available to all IAATO ship operators interested in sharing our knowledge of the fjord systems with their guests. I want to thank all of our partners for their efforts launching this citizen science project: Polar Latitudes, ANTARCTICA XXI, G-Adventures, Hanse Explorer, Quixote Expeditions, Lindblad Expeditions, and NSF. FjordPhyto will also be extending into the Arctic for the 2018 season with Hurtigruten. FjordPhyto will contribute to our greater scientific understanding of how a changing climate impacts ecosystems along the Antarctic Peninsula. Thank you for becoming FjordPhyto Citizen Scientist and Antarctic Ambassador! The Polar Citizen Science Collective has completed it's successful 2017-18 Antarctic season. Following the Field Staff Conference in Iceland in October, we welcomed 3 additional operators bringing out total # participating in citizen science programs through the Polar Collective to 5. Our most engaging project this season was FjordPhyto, our collaboration with Allison Lee of the Scripps Oceanographic Institute. We'll be welcoming her shortly as a guest blogger and she'll give us an update on how she feels the season went. Teams on board received fantastic feedback from guests regarding their involvement in citizen science programs. “Participation in citizen science allowed me to be more than just a tourist." Lauren and the Polar Collective team are thrilled to have been featured as Arctic Ambassadors for Citizen Science by NASA and it's GLOBE Observer program. Click through to read the full interview with Lauren, and thank you to the GLOBE team for their ongoing support as we extend the cloud observation program to more and more vessels in the polar tourism industry! The Polar Citizen Science Collective aims to empower the polar tourism industry to make valuable contributions to scientific research. Have a look around and click on the PROJECTS tab to see what we're up to. Thank you for your continued support and please do get in touch if you'd like to learn more about setting up a citizen science program on your expedition vessel, or participating in research while on your trip of a lifetime! We are pleased to announce that this data collection project has been officially endorsed by the Year of Polar Prediction. YOPP's mission is to enable a significant improvement in environmental prediction capabilities for the polar regions and beyond, by coordinating a period of intensive observing, modelling, verification, user-engagement and education activities. This endorsement allows us to more easily collaborate with additional partners in the science community and significantly increases the reach and use of our data. Another North Pole season is upon us and soon Alex, Annette and Lauren will be flying to Murmansk to join our Poseidon Expeditions team on board Russian icebreaker 50 let Pobedy. We've been working hard these past few months to expand our sea ice data collection project to include atmospheric observations, and we're thrilled to be coordinating with NASA and their GLOBE Observer program to record a key set of data which will be useful in their understanding of how cloud type and distribution relate to sea ice state, and other interesting climate questions. We're also looking forward to working with the Norwegian Ice Desk in creating a real-time feedback cycle on satellite imagery used to create ice charts. While our 2017 North Pole season is shorter than in years past, with only 2 cruises from Murmansk to the pole, we hope to provide valuable data and insight to our partners in the science community. And of course, we're looking forward to being back on top of the world and are hoping for many wonderful polar bear encounters! We will post as regularly as we can, but you can look forward to a detailed recap mid-July. Thank you for your continued support! Excitingly our project update was published last week while we were away in Eos, the Transactions of the American Geophysical Union! Click this link to read it! We have just completed a cruise around the archipelago of Svalbard and collected sea ice data with tourists along the edge of the pack ice. It is much harder to collect data when at the pack edge instead of deep inside it, and it is also very difficult to estimate ice thickness when not breaking and overturning the floes. This is a challenge but we are hopeful that the data will prove useful and will wait to hear what our advisors think, as there is a huge potential for crowd-sourcing data from the ice edge, with ships up here several days of the week at certain times of year. Our project has been featured in the Fall Log of The Explorers Club. This is a quarterly journal that comes in the mail to all members across the world. We've had a hectic week, first flying to Seattle to present at the Arctic Observing Open Science Meeting where our work was well received and we found some exciting leads to follow up on in the future, including deploying remote sensing buoys at the ice edge and at the North Pole! It was also wonderful to finally meet our advisors, who have so generously given their help and advice through the process, and to hand over the data we spent so much time collecting. Then we flew back to NYC, arriving just in time to speak at The Explorers Club, who had recognised our project as a Flag Expedition. It was exciting to explain what we and our backers have achieved to a full house of members, fellows and guests, and hopefully our talk will be available online to watch again soon. We were also sad to have to finally return Explorers Club Flag #69 after a long summer travelling with it. This project is finally starting to wrap up, but first we have a flag report to write, and we are starting on a manual to help other ships to collect data for the ASSIST program. And then it's time to think about next summer! Exciting news! We've just been accepted to speak at the Arctic Observing Open Science Meeting held in Seattle November 17-19, hosted by the Arctic Research Consortium of the United States. This is an opportunity to share with the science community what we accomplished with our sea ice data collection program this summer, and open up the lines of communication between leading scientists and the tourism industry. We hope we may see some of you at our talk at The Explorers Club in NYC on Monday, November 23rd. Details here. Our presentation at the conference of Antarctic and Arctic tour operators in Toronto last week went extremely well. This project was very, very well-received, and we hope walking others through how it was set up and run on board served as an inspiration to the expedition companies, expedition leaders and field staff in attendance. The conversation is just starting. There is a momentum building around the idea of "tourism for science," and we are honored and excited to be a part of it. Also, we are thrilled to be speaking at The Explorers Club in NYC on Monday, November 23rd. If you find yourself in the area, we would love to see you there. More details here. We've just returned home from the end of our Arctic season, Lauren to New York and Alex to the UK. But not for long, as this coming weekend we are both flying to Toronto to speak on this sea ice project at a conference of Antarctic and Arctic tour operators. We are thrilled to be able to share our experience and the immediate results of this project so soon after completing the season. We hope that doing so will inspire decision-makers in the industry to more proactively pursue citizen science projects and that our project can act as a guide for how to incorporate data collection into tourism program. Looking forward to giving you an update upon our return next week. We're also busy processing large quantities of the data we collected, including the GoPro video taken from the helicopter and footage from our icebreaking days. Thank you again to all involved. While the field work of this project is complete, we're only just getting started with organizing and distributing the data, and our focuses now for the next few months will be on education and outreach. We'll be sure to keep you in the loop! Our sea ice observations from our first 2 North Pole cruises have been included by the Arctic Research Consortium of the United States (ARCUS)' Sea Ice Prediction Network in its August report, noting that this is the first time they have received sea ice data collected by tourists. We have now completed our 4th and final voyage of our North Pole season, and finished with another great group of enthusiastic participants of our sea ice project. Thank you to Sushama Shashikumar, Alec Spiller, Alison Harris, Anke Wodang, Irena Paterova, Tomas Patera, Ulf Mauder, Ciprian Popasa, Elena Neacsu, Alexander Tynkovan, Dietmar Denger, Irina Gordeeva, Gavrill Gordeev, Frantisek Patera and Anne Zaglmann for joining us for observations on the bridge and in the melt ponds on your North Pole day. This 4th voyage brought significant visual changes in the sea ice. We began to see the stages of new ice forming and the end of melt as we neared the pole. In our final days, frost had begun forming on the frozen surfaces of the melt ponds. We saw notable changes in the ice in between our every-2-hour bridge observations, and wonder if we could have made just one more voyage to the North Pole, what more we would have seen. We’ll write more as we begin to package up and distribute the data we’ve collected to our advisors and other interested parties, and look forward to sharing our thoughts as we reflect on the project as a whole. We are on a very rapid turnaround, but it was another successful trip. Thank you to citizen scientists Rhona Callander, Anna Verwillow, David Izosimov, Maxim Izosimov, Edward Callander, Elizabeth Callander, Peter Wright, Nicholas Izosimov and Uwe Rosenberger. There will be a more complete update when we are in Helsinki at the end of the season. We’ve just returned to Murmansk from our 2nd voyage to the North Pole and we’re pleased to report great progress was made with our sea ice project. Alex and I are becoming more and more comfortable and confident with our equipment and in making visual observations, and over the course of our days breaking ice, were able to involve a core, interested group of guests. We consistently had 4-5 guests on the bridge with us every 2 hours making note of ice concentration, age and thickness, and a larger group taking salinity and depth measurements in a selection of melt ponds at the North Pole. Their enthusiasm and contributions were profound and it was a fantastic experience forming the first Sea Ice Research Team on board 50 let Pobedy. A huge thank you to our Sea Ice Research Team members Thais Miles, Barry Lloyd, Andrei Nemirschi, P. Venkatesan, Takao Nakagawa, Doug Maxwell, John Cise, Dan Bieri, Chris Shearer, Rob Arathoon and Jan Cleary, and to Jan Bryde and Poseidon Expeditions for continuing to support this project. We’ll leave port again tonight for our 3rd voyage, and look forward to what’s to come! We have just returned from our first trip to the North Pole. It has been a steep learning curve, but we've progressed a lot and feel more confident with our observation skills, thanks mainly to the ship's officers who have very kindly lent their advice. We spent a few days getting our equipment set up, from GPS and GoPro mounts on the ship and helicopter, to having big wooden rulers painted for us by the ship's carpenter. Working with helicopter pilot Mikael to attach a GoPro mount to the helicopter. We have used a quick-release mount that allows us to change out the camera without having to adjust its position in just a few seconds. The whole crew, from Captain Dmitry Lobusov to the carpenter, interpreter, helicopter pilot and engineers have been warm and helpful and we are very grateful to all of them. On one beautiful day we flew the helicopter for several hours as the ship sliced and smashed through ridges and pans of ice. We took full advantage, collecting overhead video footage of the melt pond coverage throughout. Melt ponds are crucial to understanding how the pack melts, as unlike the shiny white ice which reflects the sun's heat back into space, they absorb it and help to warm the region and accelerate the melt. 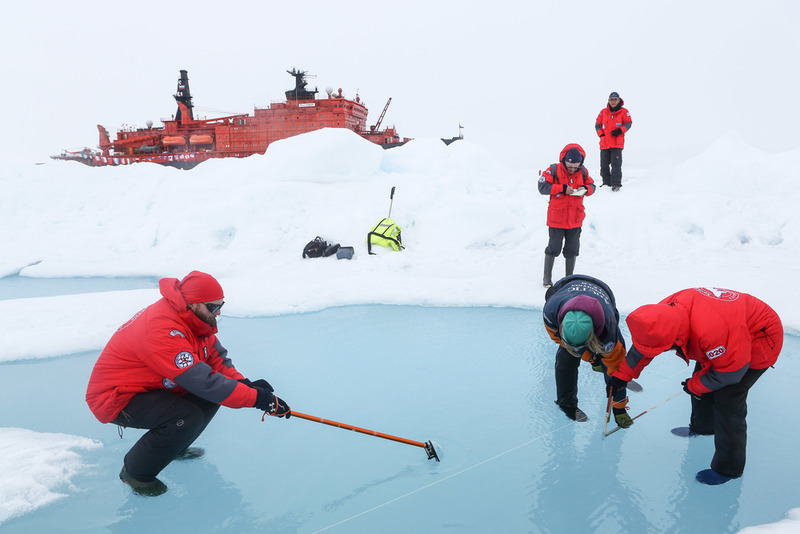 Collecting melt pond data at the North Pole. Here we are measuring the first pond's length and depth profile, as well as its salinity. On North Pole day we found ourselves pressed for time, but collected salinity profiles for several melt ponds as well as measurements of their dimensions and ice characteristics. An interesting find was that a 1.5m thick layer of fresh, warm water sits below the ice, separating it from the subzero waters of the Arctic Ocean. The day was also used for planning in detail how we will bring guests into the program on the next trip, which starts...today! We are looking forward to heading back out into the ice again, and we will have another progress update in a week and a half. Wish us luck! We've boarded 50 let Pobedy, the most powerful ship in the world, and tonight at 22:00 we'll depart Murmansk through the Kola Fjord on our way to Franz Josef Land. We're working out the logistics of our sea ice monitoring equipment and will be ready to begin taking observations when we reach the polar pack north of Franz Josef Land. Then we're bound for the North Pole! Look forward to sharing with you our progress when we're back in Murmansk in a week and a half. Alex enjoying a midnight golden hour on Russian icebreaker 50 let Pobedy. We've joined our expedition team in Oslo! We have a few days to get to know each other as we head North towards Murmansk. This morning we took the ferry to visit the Fram Museum. What a thrill to walk through the famed polar exploration vessel, known for being locked in the ice on Nansen's expedition to attempt to claim the North Pole, just days from us heading there ourselves. Followed by a visit to Roald Amundsen's house 30km out of town. Exactly what you would imagine of a polar explorer's home! Alex and I took the opportunity to take a photo with our Explorers Club flag on his front steps. Meet Thyra Heder, the brilliant designer of our expedition logo. Thyra is an illustrator and her gorgeous children's book, The Bear Report, will be available in October. We are so honored to be carrying The Explorers Club Flag #69 during our sea ice data collection program this summer. To be awarded a flag for your expedition means your efforts have been recognized by The Explorers Club as furthering the cause of exploration and field science. Flag #69 took its first expedition during the total solar eclipse of 1937 in the Andes. Since then, it has been to the Himalayas to explore the Raikot Glacier, to Antarctica for a whale song study, to South Georgia and even to the shipwreck of the Titanic. And now, Alex and I will take it to the Geographic North Pole.